A classroom / dormitory building at B.H. Corpening. The agency operates three training facilities; the Mountain Training Facility in Crossnore, the Stan Adams Training Facility in Chatham County and the Ralph Winkworth Forestry Center in Kinston. One location offers overnight accommodations, dining services and classroom environments with internet access and multimedia capabilities. The campuses are available for use by state agencies and other institutions or organizations at reasonable rates. For more information about reserving facility space, please contact the facility managers listed below. This campus is located on the banks of the Linville River on the 473 acre Gill State Forest in Avery County. It boasts a large lodge, two large dormitory / classroom buildings and a dining hall. In addition to the classrooms, it is also well-suited for most types of outdoor training. Areas are available for search and rescue, firefighting, compass and map, law enforcement and environmental education activities. For more information, please contact Chasity Webb at 828-733-4242. Located at the Kinston Global Transpark, the Ralph Winkworth Training Facility features classroom accommodations. While at the facility, visitors may have the opportunity to view the NCFS's fleet of fire-fighting aircraft. For more information about the Ralph Winkworth Training Facility, please contact Assistant Regional Forester Tommy Sports at 252-520-2402, extension 223. 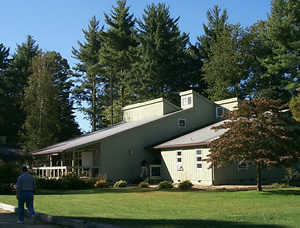 Located in Chatham County, this facility is a newly constructed (2010) classroom building at Jordan Lake Educational State forest, which makes it ideal for outdoor training. The classroom can accomodate up to 150 students and the facility can be divided into two rooms capable of holding 75 students each. There is also a small kitchenette available for storing and serving refreshments and snacks. For more information about the facility, please contact Annie Lott at 919-542-1515 or diana.lott@ncagr.gov.